Using employee wage data from the Bureau of Labor and Statistics and the Cost of Living Index from Numbeo, we can learn how much interpreters earn and how far that wages goes when you compare it to the cost of living from that area. 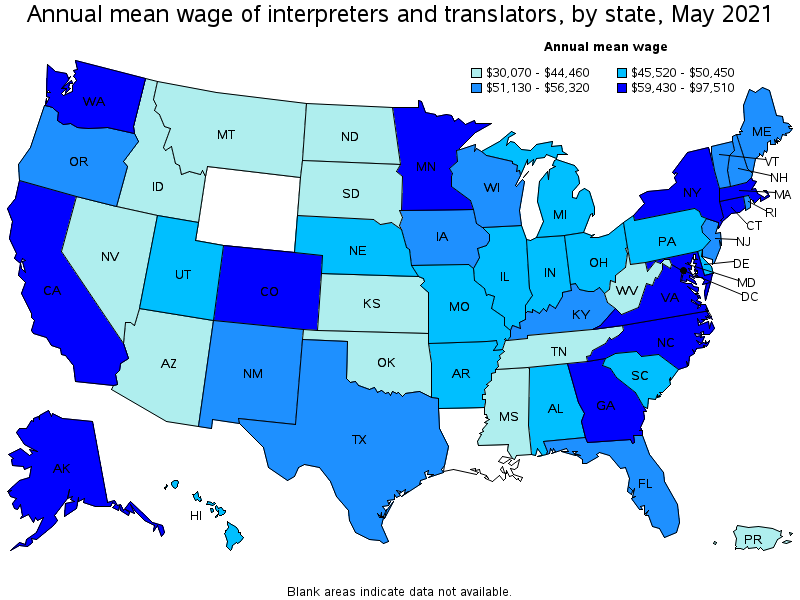 Before we determine how much interpreters should charge, it's important to understand how expensive your metro area is and what the current median wages are. Other considerations should include the cost of the academic programs necessary to become an interpreter. 2017 National Median Wages are $22.69 per hour or $47,195.00 per year. An expected growth of 18% over the next 10 years. For comparison purposes, the median wage of all employees in all fields, nation-wide was $37,690.00. Seattle and Miami's wages seem too low. I replaced 2017 data with 2016 data for this graph. The 2016 data had higher wages, but still lower than seems realistic. No surprise why Austin, TX interpreters are pushing hard for new agencies to respect their traditional practices for billing, and why national agencies have struggled to break into that market and disrput the existing business models. The wages are high and the cost of living is quite low. Washington, DC continues to lead as an example with a high wage and appropriate purchasing power. It also makes sense that interpreter wages in the D.C. MSA would be higher with more Deaf employees in federal government positions, at Gallaudet, and the type of environments interpreters work in, which is different than other states that are primarily E-12 or medical work. The BLS wage data is the most recent report from May 2017. Translators and interpreters are bundled together (industry code 27-3091). Numbeo is based on user inputted expenses and thus has a margin for error. Wages are based on median wages, not averages to try to get as realistic as possible projections. The BLS only collects data in this profession for workers who are employees, it does not include data on self-employed interpreters who do not process their own payroll for themselves (like an S-corp would do with with one employee). The annual wages are simply 2,080 hours of work x the median hourly rate. So, it incorporates part time video interpreters, educational interpreters who may only work 9 months a year, and other positions. Traditionally, wages for employees are less than self-employed interpreters, but there are many fringe benefits that employees get that private practice interpreters do not.